We all get cravings for the sweet things. This can be hard, as we are also always trying to resist caving to the cravings because they are not ideal for our fitness goals. 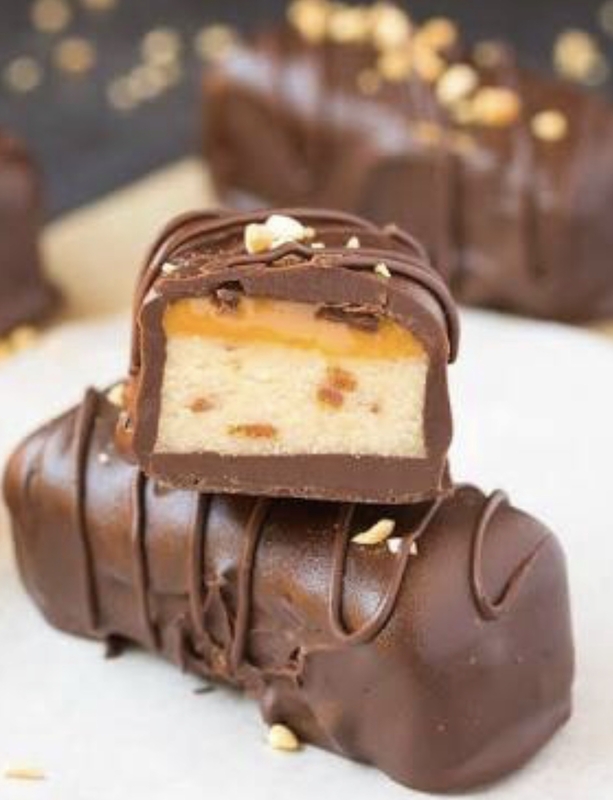 BUT… if you can make something delicious like these “healthy version” Twix Bars then you can have your cake and keep your fitness goals too! Prepare these little gems and keep them in the fridge. You might be tempted to eat them all at once, but try not to. The perfect DIY treat for the weekend! Preheat the oven to 180°C and line a 20cm square baking tin with baking paper. To make the base; mix the coconut flour and salt in a bowl. Stir in the coconut nectar Syrup until all is combined, then add the coconut oil or butter and mix together with your hands to form a smooth dough. Using your fingers, press the mixture firmly and evenly into the base of the prepared tin, then bake for 10–12 minutes, until golden brown around the edges. Remove from the oven and leave to cool. For the caramel filling; melt the ingredients together in a saucepan over medium–low heat, stirring slowley, until nice and runny. Pour the filling over the cooled base, place in the fridge and leave for 30 minutes, or until chilled and set. To make the chocolate topping; melt the raw cacao butter in a small saucepan over low heat, then add the cacao powder, your choice of sweetener (I use stevia) and the vanilla and stir until well combined and thick and creamy. Once the caramel filling has set, pour the melted chocolate over and smooth the surface. Sprinkle over the salt (this is my preference) or some crushed nuts, and return to the fridge for 30 minutes for the topping to set. To serve, remove from the fridge and cut into finger slices with a warm knife. HINT: You may choose to cut into finger slices prior to covering in chocolate so that you get chocolate coverage all around the bar and not just on the top.